Make tacos: In a small bowl, whisk together jerk seasoning and ¼ cup oil until combined. Pour into a large resealable plastic bag and add steak. Press out as much air as you can and seal. Shake to coat the steak in the marinade, then chill for 1 hour or up to 24 hours. In a large skillet over medium-high heat, add remaining 2 tablespoons oil. Add steak and cook until nicely seared but slightly pink in center, 6 to 8 minutes per side. Remove from heat and let rest 5 minutes. In a small bowl, stir together pineapple, onion, cilantro, lime juice, and salt. Thinly slice steak across the grain. 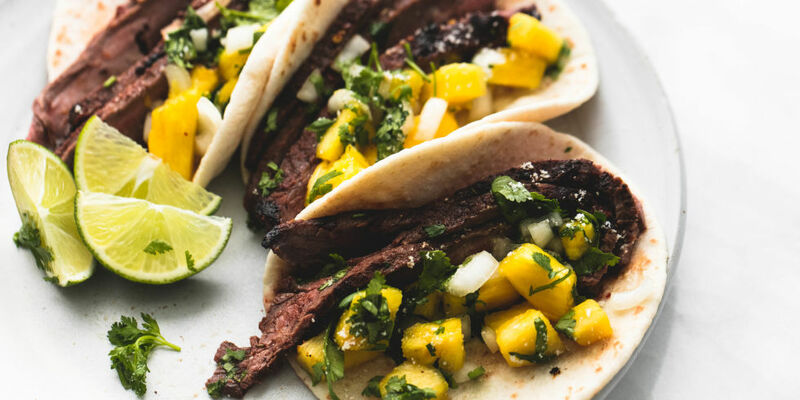 Serve in tortillas with pineapple salsa and avocado. Top with cotija cheese if desired and serve with lime.